This hotel is 5 minutes' walk from the Historic Santa Fe Plaza shopping and entertainment area. The hotel offers an outdoor swimming pool, free WiFi and dining options. Two blocks from the historic Santa Fe Plaza in downtown Santa Fe, our hotel is within walking distance of amazing cultural attractions like the Georgia O'Keeffe Museum, the Santa Fe Community Convention Center and fantastic shopping and dining venues. We are also just 10 miles from Santa Fe Municipal Airport (SAF), so perfect for a stay before your travels. 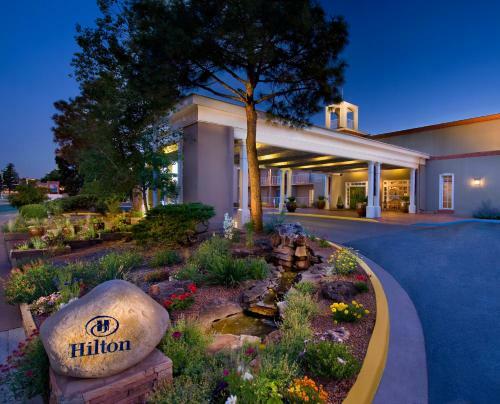 Hilton Santa Fe Historic Plaza hotel is just two blocks from the historic Santa Fe Plaza, featuring fantastic shopping opportunities, fine dining and a range of museums at Museum Hill. Lensic Theater offers more than 200 events each year, and we are also within walking distance to New Mexico State Capitol and the Palace of Governors. Our guest rooms feature a southwestern motif and capture the brilliant colors of New Mexico. Looking for a special treat? Stay in a luxurious guest house (casitas) built within the walls of the historic coach house, founded in 1625. For your peace of mind, we now offer PURE Allergy Friendly Rooms. PURE creates an allergy friendly environment through a seven-step, patent-pending purification system targeting air and surfaces, removing up to 99% of pollutants so you can breathe easy, and rest peacefully. A PURE room allows you to get a better night's sleep and wake refreshed so you can enjoy your visit. The fitness center offers both weight and cardio equipment, while the seasonal outdoor pool and year-round hot tub and kiva fireplace are perfect for taking some time out to relax. Here on business? We offer 8,000 sq. ft. of event space so you can host meetings or social events at the hotel. Enjoy culinary masterpieces for breakfast, lunch and dinner at our new Ortiz Restaurant. In a rush? Stop by Ortiz Café serving Starbucks coffee, hand-carved sandwiches and soups, as well as indulgent pastries baked in-house daily by our own pastry chef.